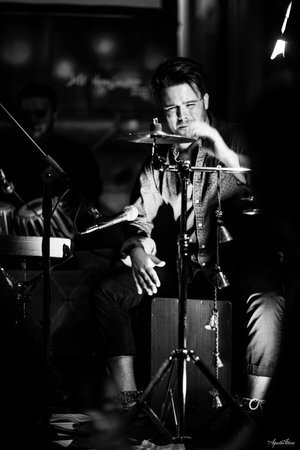 Jeremy Smith is a percussive artist whose unique versatility allows him to move seamlessly among numerous musical worlds. While the foundation of his playing comes from his classical training at Juilliard, his interests lie in the vast array of modern and folkloric percussion traditions from around the world such as those found in South America, Africa, India, the Middle East, and jazz. In 2016 he was invited to the International Percussion Festival in Seoul, South Korea as a solo world percussion concert artist. He performs and tours regularly with the exotica global jazz quintet Mr. Ho’s Orchestrotica, as well as handpan artist Adam Maalouf and his project Future Tribe. He has also performed and recorded with groups and musicians such as Latin Grammy nominee Luisito Quintero, New York Gypsy All-Stars, Jorge Glem, Terraza 7 Big Band, Zashaz, Festejation, Aimua Eghobamien Adison Evans, Zāna, and many more. Jeremy is also an accompanist for modern dance classes, specializing in Horton technique accompaniment at Steps on Broadway and Peridance Capezio Center. As a passionate educator of world percussion and rhythm education, Jeremy has presented clinics and classes at the University of Michigan, Columbia University, and Bowling Green State University. He also meets regularly with students from around the U.S. via Skype or live at his home New York City.